Cream butter and sugar together to give a very light consistency. Add 1/2 the flour and beat together. Add remaining ingredients and mix well. Pipe mixture using a large star-shaped tip in lines of 3 inches long and of double thickness. Sprinkle chopped pecans over the tops of the cookies. Allow to cool. 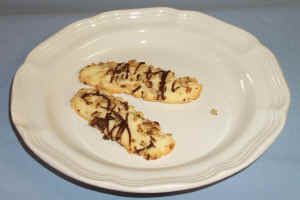 Drizzle chocolate over each cookie and let set for the chocolate to harden.